Team-based racing games usually disappoint because the team dynamic rarely actually comes into play since you still always have to win so it rarely matters how your teammates perform during a race. 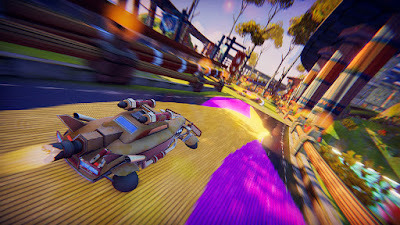 Trailblazers changes all of that with team racing that actually feels like a team effort thanks to the introduction of a Splatoon-like painting mechanic where contributing by painting the track in your team’s color while in last place is just as important as taking the checkered flag. 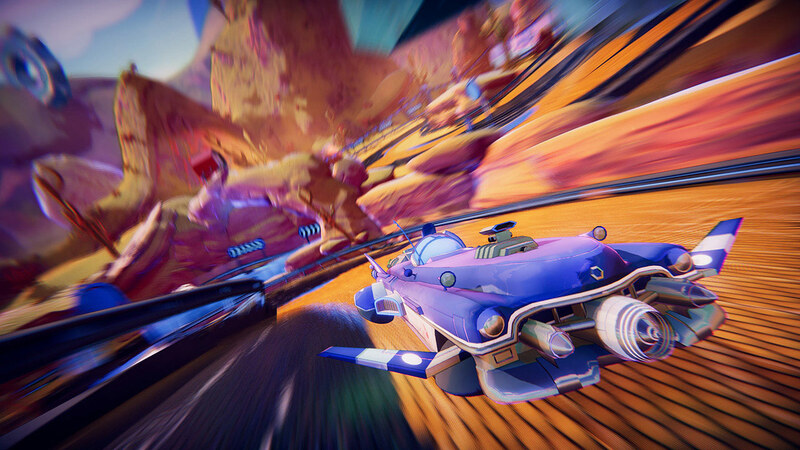 With a bright and colorful visual style, absolutely fantastic soundtrack, and fresh gameplay ideas, Trailblazers seems like a winner, but how does it fare out on the track? Find out by continuing to read our full Trailblazers PS4 review. Trailblazers takes place in a sci-fi world where you’re a group of ragtag drivers trying to break into a futuristic racing league. There are humans, aliens, and robots so it’s a bit like F-Zero or the anime movie “Redline”, which is cool. You swap between different characters – each with unique vehicles and different strengths and weaknesses - throughout the surprisingly lengthy story mode, and every race is contextualized with character motivations via text (and Simlish mumbling) cutscenes. While it is commendable they actually bothered to put in a story, I have to admit I got bored with it pretty quickly and started skipping over it pretty early on. I just wanted to get to the racing and the cast of quirky characters got old pretty quickly. 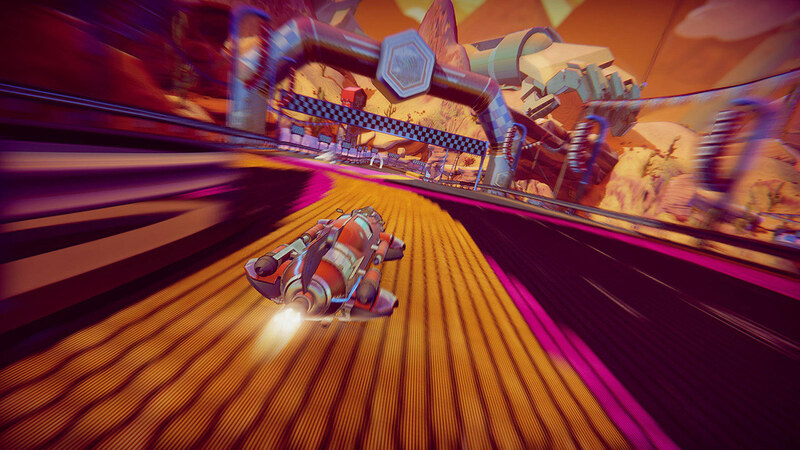 The racing, on the other hand, is fresh and fun and offers up some unique thrills you won’t find in many other racing games. The biggest and most important new idea Trailblazers brings to the table is the concept of painting the track in your team’s color. With the press of a button you lay down a stripe of paint that acts as a turbo boost for you and your teammates. The other team(s) are also painting the track too (and covering up your paint), of course, so after several laps the entire track is covered with criss-crossing layers of different colors. The idea is to try to keep long uninterrupted stretches of your team’s color intact so you can boost for as long as possible. Your paint can also be an offensive weapon, too, as you can fire it forward in a long stripe that will spin out opponents if it hits them. The other important aspect of Trailblazers is that it is largely a team sport and you can contribute just as much by going slow and doing a good job painting as you can by running out front and winning. 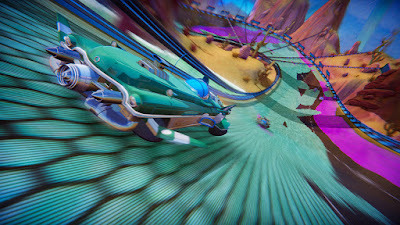 The story mode gives you three different objectives for each race which consist of things like reaching a point threshold for painting or racing well, beating specific opponents, hitting a set number of gates (which put out long lines of paint when you go through them), and more. Simply meeting one of the objectives in an event allows you to progress through the story. All of this adds up to a surprisingly dynamic game that rewards players for contributing in many different ways. Painting is extremely important, so making a clean path for your teammates to follow, or carefully taking advantage of the path they leave for you, is the key to victory because the turbo boost provided by running on your team's paint is very, very fast compared to running at normal speed. Because your opponents are also painting, however, every lap is wildly different from the ones that preceded it that gives each race a satisfying tug-o-war feel as you’re constantly jockeying for position. It also leads to some thrilling finishes when you slingshot around an opponent right at the last second to steal a position thanks to a carefully aimed shot or strategically placed line of paint from a teammate. Trailblazers is a blast. When it all works, Trailblazers is unique and thrilling and awesome. It doesn’t always work, though. The A.I. is basically perfect so part of the reason why you have to resign yourself to running in the rear and contributing by being a great painter is that the CPU drivers (even your teammates) are really hard to beat. The fact that your success or failure depends on ever-changing lines of paint also means that sometimes you can go as fast as you possibly can but still not be good enough, which is honestly pretty frustrating to not be in full control of your own destiny in a racing game. There are a couple of other major problems with the gameplay. First, your vehicle almost feels magnetized to hit track walls and opponent vehicles. If you brush a wall it is hard to get off, for example, which saps all of your speed. Likewise, if you attack an enemy and spin them out, more than likely you just plow straight into them and get stuck for a few seconds, which obviously slows you down. This is really frustrating. I also had a glitch on several different tracks where the game reset my position after I went around a corner, as if the game thought I went off the track or something and it would happen on the same corner every lap until I reset the game. It’s hard to be competitive when the game keeps respawning you even though you didn’t do anything wrong. Like I said, when it all works, Trailblazers has the potential to be great and unique fun. It just doesn’t work like it should all the time and after the initial thrill of playing something so unique and fresh wears off, the flaws start to show through and are hard to ignore. The game has a story mode as well as local and online multiplayer. Playing against human opponents leads to some interesting races, since humans are generally not as perfect as the A.I. and can actually work effectively as a team, so it’s a little better in multiplayer than solo. It’s a bit of a shame the gameplay doesn’t hold up better because the presentation in Trailblazers is awesome. The tracks are bright and colorful and cool looking and the characters are all unique and have a distinct cartoony style that is pretty appealing. The real star of the package is the soundtrack, however. This collection of upbeat funky electro-pop tracks feels like the second (third) coming of SEGA’s Jet Set Radio series. Yes, that is high praise, but the music here is freaking awesome! All in all, Trailblazers is extremely promising at the start with a unique premise and fantastic presentation, but gameplay flaws flare up pretty quickly that are hard to ignore. Any racing game where victory isn’t necessarily tied to your own skill and performance is a hard sell anyway, but when the A.I. is impossibly perfect and glitches and other issues constantly slow you down it’s hard to have a good time even if you don’t “have” to win. Trailblazers almost gets it right but comes up short where it counts out on the track. Skip it for now.